Racing returns this weekend after the break for the Lunar New Year holiday with big cards across the board and some big names making an appearance. It’s been four months since Never Seen Before galloped down the home straight at Seoul to win the Minister’s Cup, the final jewel in Korea’s Triple Crown. Now finally, the colt who gave Aussie trainer Peter Wolsley his first Korean Classic victory, reappears on the track. This time he is at home, in Busan’s Friday afternoon feature. He shouold be the favourite although he will have the likes of Useung Radar and Damyangui Jilju for company in the Class 1 handicap over a mile. Sunday at Busan also sees a heavyweight – literally – match-up as the top-rated horse in Korea, Beolmaui Kkum, carrying 60kg looks to make it two out of two for 2015 with Gamdonguibada among those out to stop him in the feature handicap. Earlier on Sunday, Busan plays host to the Macau Jockey Club Trophy while up at Seoul, the Sports Seoul Trophy headlines Sunday’s card. February turns into March and while we seem to be getting one last blast of winter in the Korean capital right now, it should be mild by the weekend. * Peter Wolsley is on fire: With five winners across last weekend, trainer Peter Wolsley has shot to the top of the Busan Trainers’ Championship, leading the Kim Young Kwan machine by 14 winners to 12 and 49% of all runners placing first or second. Wolsley has some solid talent in his stable at the moment and also a pair of in-form stable jockeys in the shape of champion rider Jo Sung Gon but also with Lee Hee Cheon, who has been an absolute revelation under the Australian’s tutelage over the past few months. Such is the firepower that is always available to him, Kim Young Kwan will amost certainly take the ultimate prize but it looks set fair for another very good season for Wolsley. This Korean language blog, which I’ve just seen for the first time has some really good pictures of Wolsley and Lee Hee Cheon winning the Minister’s Cup with Never Seen Before last October. * Tough Win is back: The 2011 Grand Prix Champion’s best days looked to be behind him but he returned to the winner’s circle for the first time for 18 months in January and then followed it up last week with another victory; his 24th from 37 career starts and took him to over $2Million in prize-money. He’s done it in style too, closing from dead-last in the home straight. As long-time racing observer Thomas Song pointed out on this site, closing to defeat tired frontrunners is the only way Tough Win can run these days, but it is thrilling to watch and hopefully there is plenty more to come. * We have some good three-year-olds: The likes of Cosmos King at Seoul and Rafale and Doraon Hyeonpyo at Busan have all won around two-turns already and they, along with a number of others, should make for a fascinating Triple Crown series which this year, will be concluded by July. * The new rating system is here to stay: Every horse in Korea now has a rating and aside for some Grade and Listed races, there are no longer races restricted to Korean bred horses at Class 1 and Class 2. It is hoped that the stronger competition will make for a better quality of Korean racehorse and more competitive racing for punters. The early evidence, especially at Busan, is positive. With horses able to move back down in class for the first time, we’ve seen some compelling contests already. Now that connections at Seoul have belatedly signed up to the changes too, racing in the capital – in need of a new lease of life for some seasons – will hopefully be on an upward spiral soon too. * Gyeongbudaero : If the KRA’s race-planners had scripted the first class 1 to be run under the new system, they would have come up with something like this. 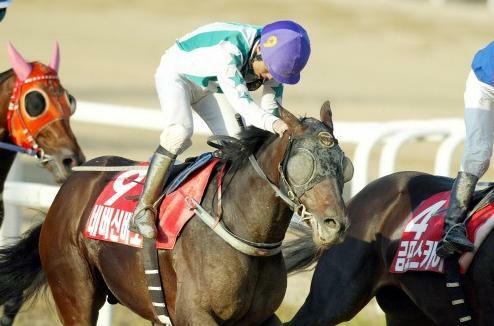 Six Korean bred horses faced off against six imported horses and after a tough battle, the locally bred Gyeongbudaero, carrying top weight of 60kg, prevailed. Winner of the 2014 President’s Cup and Grand Prix Stakes, Gyeongbudaero’s image was on the front of the KRA’s 2015 Race Plan booklet announcing the changes and he is undoubtedly the poster-horse of Korean racing right now. For the second time in three years, Cheonnyeon Dongan ran out victorious in the Donga Ilbo Trophy at Seoul Racecourse on Sunday. 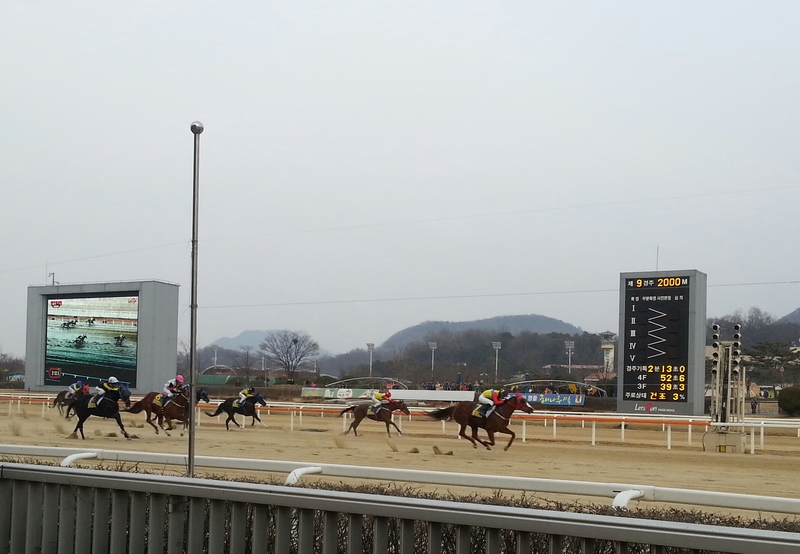 The odds-on favourite ran on for a 4-length win under champion jockey Moon Se Young. The last time she won this race, it was held in September and a change in the racing calendar meant that the past two winners of the trophy would face-off much earlier this year. Last year’s winner, Ua Deungseon was sent off third in the betting but she never really featured, coming home in 5th as Cheonnyeon Dongan took things up in the home straight and cruised clear. No a 5-year-old, Cheonnyeon Dongan (Ecton Park) has won 9 of her 21 career starts. This was her third big race win with a Nonghyup Chairman’s Trophy added to her two Donga’s. Tough Win reached another milestone in his remarkable career at Seoul Racecourse on Saturday as the 8-year-old broke the 2 Billion Won mark in career prize money. After spending much of 2014 on the sidelines, Tough Win roared back to form last month with an against the odds win in a big handicap. It was his first visit to the winner’s circle since his second triumph in the Busan Mayor’s Trophy in the summer of 2013. He didn’t have to wait long for a repeat. Despite carrying top weight of 59kg and despite being up against rising-star Haemaru, who came into the race off the back of six consecutive victories, punters made Tough Win the favourite for Saturday’s feature class 1 event over 1800M. And it was vintage Tough Win. With Cho Kyoung Ho having retired, it was yet another new jockey on board him for the first time. Lee Sang Hyeok had the honours and he took the 2011 Grand Prix Stakes winner right to the back as the exited the gate, giving the rest of the field a full ten lengths head start. Tough Win likes it that way. Although they closed the gap a little, Tough Win remained last as they entered the home straight, going wide around the field to find his run. Once they did, the race was over. He hit the front a furlong out and eased home comfortably for a three-length victory ahead of outsider Double Shining. Haemaru was 3rd. It was a 24th career victory for Tough Win (Yonaguska) on his 37th start. While cynics will, with some justification, point to a lack of strong competition at class 1 at Seoul right now giving him this window to return to the top (and it is undoubtedly weaker than it was when he was battling it out with the likes of Dongbanui Gangja four years ago) – his achievement is still noteworthy. It is very hard for an imported colt (or gelding as Tough Win is) to amass such an amount of prize money. Korean bred horses have the Triple Crown races and the President’s Cup while the best imported fillies such as Gamdonguibada can harvest the lucrative Queens’ Tour events. Tough Win has always had to do it the tough way. Now we know that win in January wasn’t a fluke, the question is whether he can maintain it in the long season ahead. Principally, can he keep it up long enough to go to Busan to take on the current set of big boys in the summer for a tilt at a 3rd Mayor’s Cup? It’s Valentine’s Weekend so where better to spend it than at the racecourse? The Donga Ilbo Trophy headlines at Seoul while both in the capital and at Busan there are big fields all round. The Donga Ilbo Trophy is this year restricted to Korean bred fillies and mares and has attracted a field of ten. Chief among them is Cheonnyeon Dongan, who won the race back in 2013 when it was held in September, and Ua Deungseon, who took last year’s event just five months ago. With the unrest of last week now over, Seoul will hold a 13-race card on Saturday and a 10-race card on Sunday. At Busan there are full fields on Friday and among them are some fascinating races with horses being able to drop down in class for the first time in Korea. This looks set to give a new lease of life to those who found themselves with too many points for class 2 but not good enough for class 1. Peter Wolsley has a solid set of runners at Busan on Friday including the exciting Macheon Bolt while jockeys Joe Fujii and Masa Tanaka are riding live chances throughout the day. Nobuyuki Oyama and Nozomu Tomizawa will also be in action. South African trainer Bart Rice will have one runner on Sunday. Full racecards are available here. 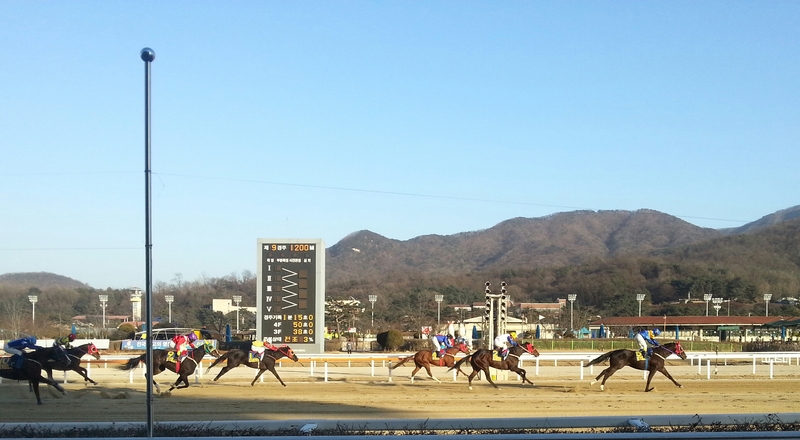 Seoul Racecourse: 10 races from 10:50 to 18:00 including the Donga Ilbo Trophy at 16:55. Gwanggyo Bisang strolled to his third career Stakes win with an easy victory in the Segye Ilbo Cup at Seoul last Sunday. However, the star of the weekend was Gyeongbudaero, who carried 60kg to victory in the first class 1 “Open” race at Busan. Now a 5-year-old, Gwanggyo Bisang is the top rated Korean bred horse in the capital and he showed exactly why when coming from behind in the final two furlongs of the 1200M Segye Ilbo Cup to take the line almost two lengths clear of closest rival Ganghae. A slight disappointment in the President’s Cup last November and then again when sent off the strong favourite in a class 1 handicap just before Christmas, Gwanggyo Bisang this time made no mistake as he secured the 12th win of his 19 race career to date. Distances: 1.75 Lengths / 0.75 lengths – 13 ran. The winner of that aforementioned President’s Cup was, of course, Gyeongbudaero. He would then go on to win the season-ending Grand Prix Stakes as well and his eagerly anticipated 2015 debut also came on Sunday. 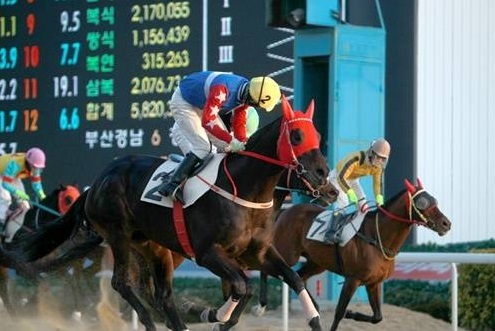 It was a debut that was given extra significance in that it was in the first class 1 race to take place since the practice of providing separate races for Korean bred horses at the top-level was ended (except for some Stakes races). Despite carrying top weight and facing some very good imports in the shape of Spring Gnarly (Master Command), undefeated in seven and Cheonji Bulpae (Bernardini), one of the highest rated horses in the country, the Korean horse was immense. Under jockey Choi Si Dae, Gyeongbudaero was in close attendance the whole way around before accelerating away in the home straight. He held off the challenge of fellow domestic-bred Gumpo Sky (Vicar) for victory by just over a length. It was his 12th win in 29 career starts, however, 13 of those starts have been in Stakes races. He’s only ever been out of the money twice and has won over US$2 Million in prize money. And he’s certainly not finished yet. 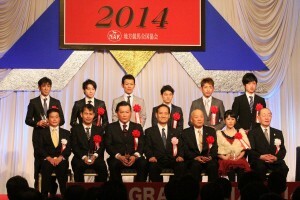 Ikuyasu Kurakane picked up his Grand Prize award at the NAR Grand Prix ceremony in Tokyo on Thursday. 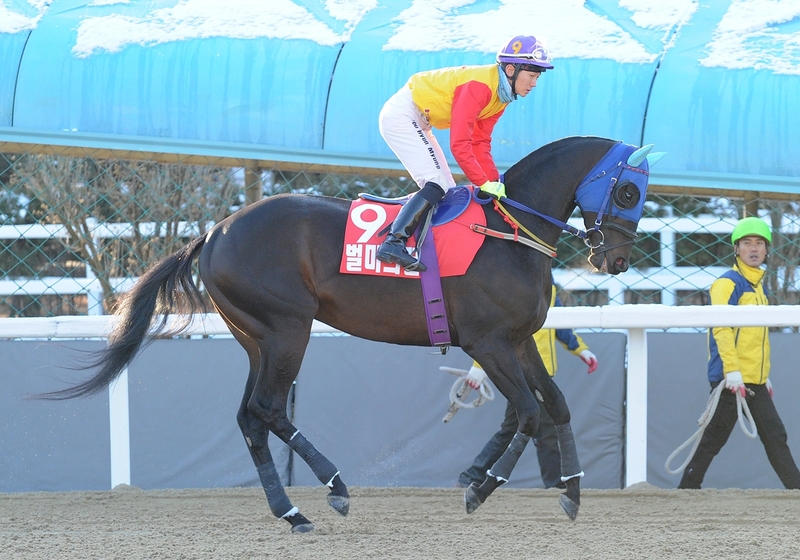 Kurakane was honoured for becoming the first foreign jockey to ride more than 100 winners in a year in Korea and being named Seoul Racecourse Jockey of the Year. The popular rider is based at Kochi Racetrack in Japan which falls under the auspices of NAR which administers Local Government organised racing in that country. 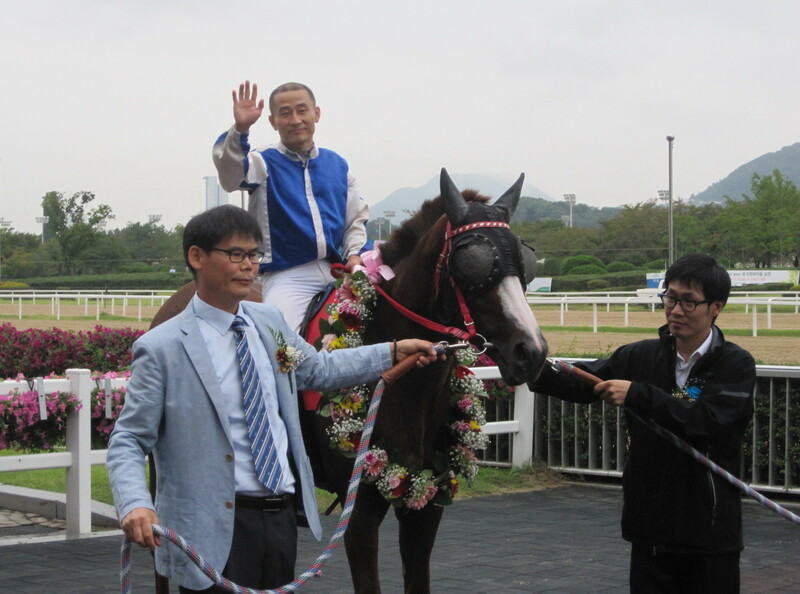 Kurakane rode 101 winners at Seoul in 2014 from 674 rides including the KRA Cup Classic on Samjeong Jewang, the biggest win of his time in the country. The jockey previously rode at Seoul and Busan in 2007 and 2008 , returning in 2013 after a five-year absence. That his wins came at Seoul makes his acheivement all the more impressive and his departure means there are currently no foreign riders in the capital’s weighing room. There are four Japanese jockeys riding in the more welcoming environment of Busan.